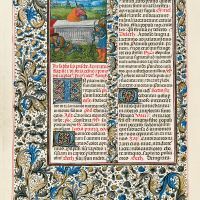 Shelf mark: Add. 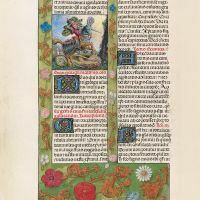 Ms. 18851. 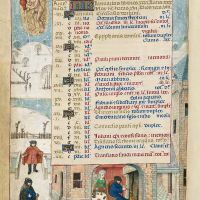 Date: last decade of the 15th C.
Size: 230 x 160 mm. 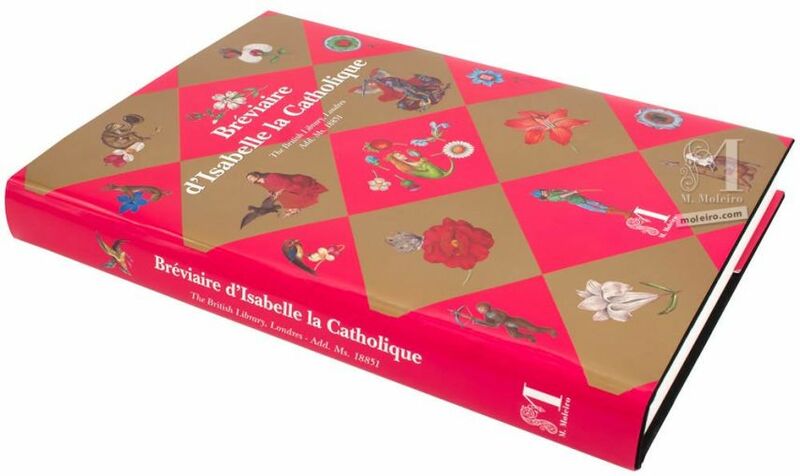 Bound in embossed, brown leather. 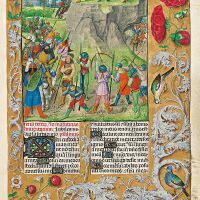 Full-colour commentary volume (352 p.) by Scot McKendrick (Head of History and Classics at the British Library), Elisa Ruiz García (Professor of Diplomacy and Paleography, Universidad Complutense de Madrid) and Nigel Morgan (Emeritus Honorary Professor of the History of Art, Cambridge University). 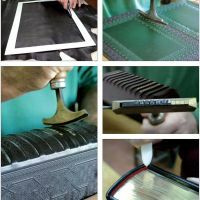 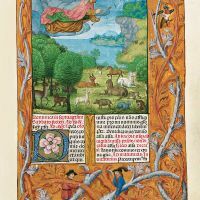 The Isabella Breviary is the British Library’s most highly prized treasure. 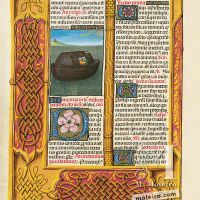 This amazing manuscript was conceived of as the most luxurious Flemish breviary. 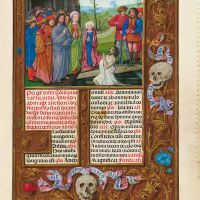 Each of its pages has been masterfully illuminated by the finest Flemish painters, resulting in a lavish manuscript of peerless beauty. 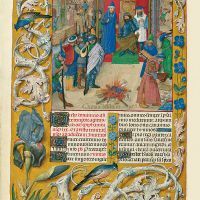 The originality and impact of the miniatures in the Isabella Breviary make this a unique codex. 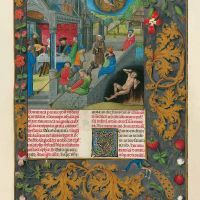 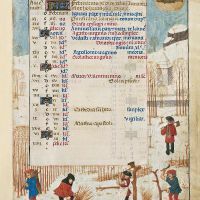 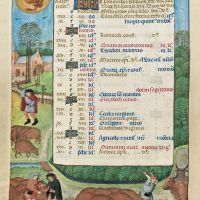 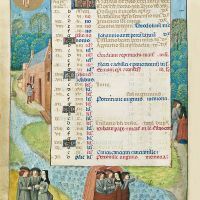 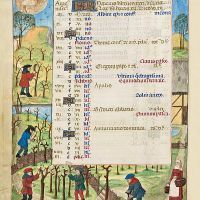 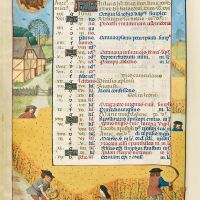 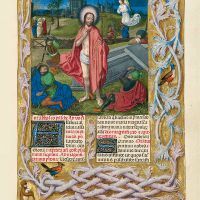 Having more texts than a book of hours, a breviary offers illuminators a wider range of themes and consequently more artistic license and a greater variety of images. 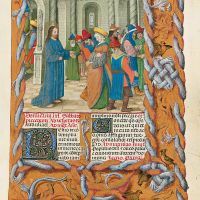 The six masters who worked on the Isabella Breviary paid particular attention to the scenes depicting the building, destruction and reconstruction of the temple and city of Jerusalem and also the celebration scenes with musicians and singers led by David. 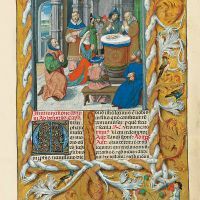 No other contemporary manuscript features a similar series. 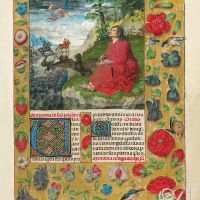 The main painter in the Isabella Breviary is the Master of the Dresden Prayerbook, an artist remarkable for the narrative expressiveness of his images and his ability to breathe life and movement into his scenes. 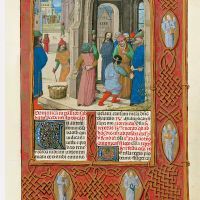 His skilful portrayal of gestures and facial expressions, underlining the main action of each episode, is astounding. 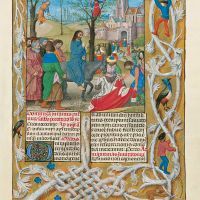 Gérard Horenbout, also known as the Master of James IV of Scotland, is the second greatest illuminator in the Isabella Breviary. 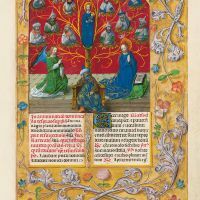 This brilliant miniaturist, also the creator of the Hours of Joanna of Castile, was one of the first Flemish illuminators to incorporate elements characteristic of the Renaissance into his miniatures. 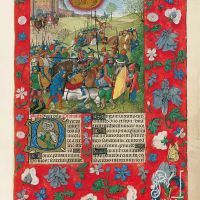 The scenes Horenbout painted for this outstanding breviary are noteworthy for the brilliant use of colours and masterful representation of textures and fabrics. 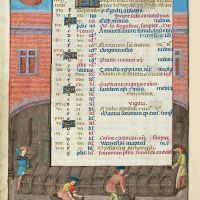 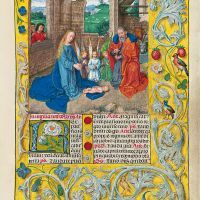 Some of the most important miniatures in this breviary, including the Nativity, the Adoration of the Magi, St Barbara, etc, are the work of Gérard David’s privileged hand. 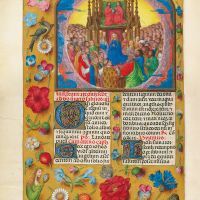 The exuberant marginal decoration in the Isabella Breviary deserves special mention. 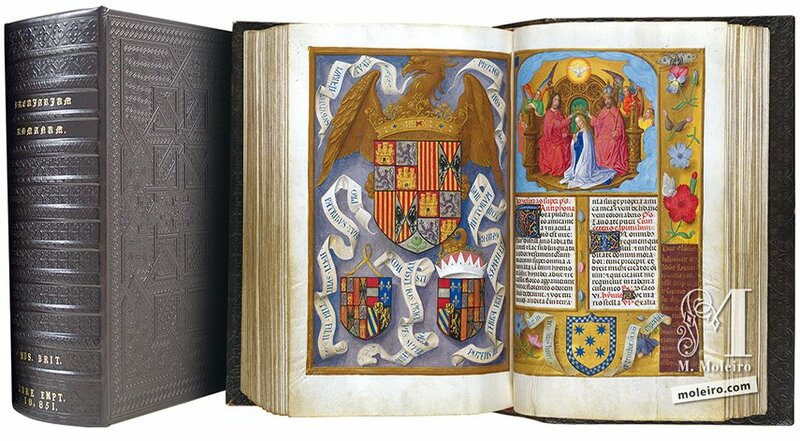 It features an unusual combination of modern borders giving the impression of strewn flowers, acanthus leaves and branches interwoven with a type of margin that was already rather uncommon around 1490 with blue and gold acanthus leaves, flowers, insects and birds. 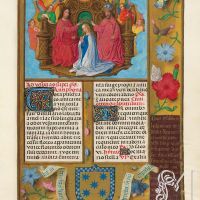 Isabella the Catholic was given the manuscript shortly before 1497 by her ambassador Francisco de Rojas to commemorate the double marriage of her children, Infante John of Asturias and Infanta Joanna, to the children of emperor Maximilian of Austria and duchess Mary of Burgundy, Margaret and Philip. 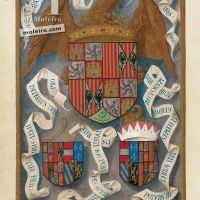 A full-page miniature shows the joint coat of arms created by Isabella and Ferdinand with a large eagle, the symbol of St John the Evangelist, and the coats of arms of the two new couples underneath. 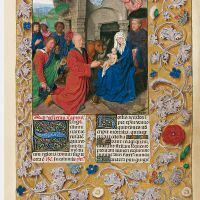 The Isabella Breviary is of great historical importance because it reflects not only the artistic context but also the great political unrest in late-fifteenth-century Europe, a time when royal marriages meant international political alliances, territorial expansion etc. 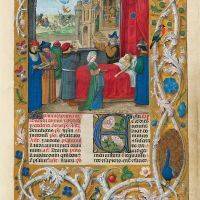 Queen Isabella died in 1504 and it is not known what became of the codex in the following three centuries. 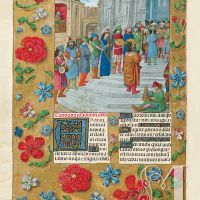 It may have been plundered from El Escorial during the Napoleonic invasion. 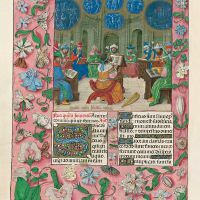 It appeared in England in the early 19th century, in the collection of John Dent, a bibliophile, banker and member of Parliament. 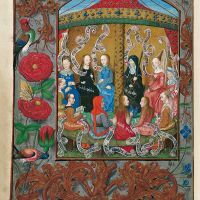 The British Library acquired it from another private collector in 1852.